Pokemon Go continues its string of summer events – and the next Pokemon to get the community day treatment is a good’un. This weekend: Eevee community day. The Eevee Community Day event follows on from a lot of other community-driven Pokemon Go events. We’ve had Squirtle in sunglasses, Pokemon Safari Zone in Dortmund, Pokemon Go Fest in Chicago, and a Zapdos Day Event – now it’s Eevee’s turn, with the event taking place on this Saturday and Sunday. Eevee is of course one of the most popular Pokemon thanks to its wide range of Eevee Evolutions in Pokemon Go and the rest of the Pokemon series. In Go Eevee can currently evolve into five different forms: Vaporeon, Jolteon and Flareon from gen 1 and Epseon and Umbreon from gen 2. This event is a worldwide affair, and it’ll run for all Pokemon Go players on August 11 and August 12. That’s this Saturday and Sunday, so clear your schedules – you’ve got three hours on each day in which Eevee will spawn more commonly out in the wild – and this in itself carries with it a lot of rewards, which we’ll get into in just a moment. If the Eevee Community Day event is anything like the one for Squirtle, a diligent player will be able to catch a whole lot of Eevee in a very short time, thus grinding out a lot of Eevee Candy and different catches in hopes of getting one with a good set of stats. As a reminder, there’s also some buffs in these hours. Lures will last for 3 hours at a time (so dropping one on a nearby Pokestop will last the entire duration of the event) and trainers will get triple stardust for catching Pokemon. Pair this with a Star Piece and you’re in for a real treat Stardust-wise, really letting you buff your Pokemon. Remember that you may want to hold on to a couple of Shiny and non-Shiny Eevee at the end of the event – even once you’ve evolved to get all five of the current Eevee Evolutions, another two Eevee Evolution Pokemon are on the way pretty soon. Obviously, the main reward for taking part in Pokemon Go’s Eevee Community day this August will be the chance to catch yourself a whole lot of Eevee. This has a few benefits: it gets you the Pokemon, the candy, and potentially a Pokemon that can evolve into one of the strong Eevee Evolutions, a few of whom are some of the best Pokemon in Pokemon Go ranging right the way across every Pokemon type in the game. Unique Move – Last Resort: An all-new normal-type move. Two-bar charge. Stats unknown, but it’s powerful in the main Pokemon games. Lure Bonus: all lures dropped during the community day event for Eevee will last 3 hours – meaning they’ll last the duration of the event! Stardust Bonus: all stardust gained through catching Pokemon and other actions during the community day event will be tripled. Use this in combination with a Star Piece item for an even bigger bonus still! 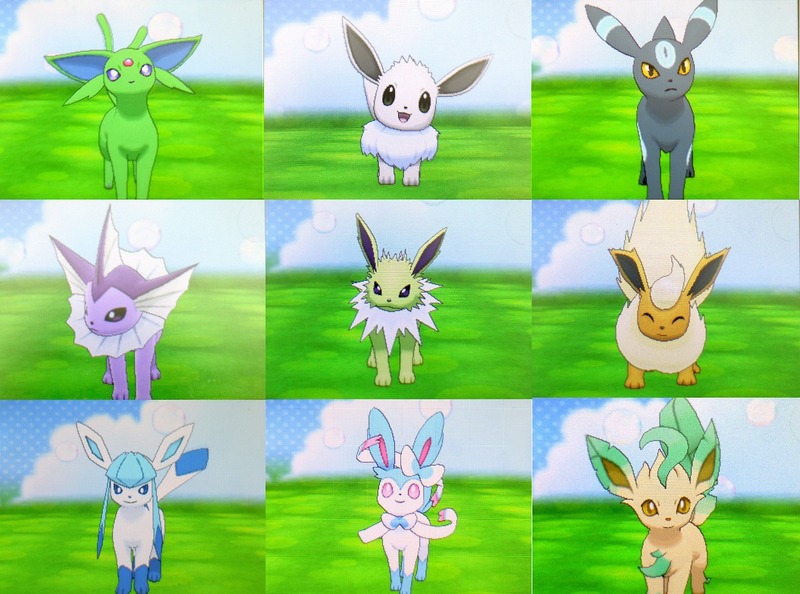 Above you’ll find a quick little look at what Shiny Eevee and the rest of the Eevee family look like in Shiny form. The image above are from the main line Pokemon games, but the coloring and design of shiny Pokemon in Pokemon Go is identical nonetheless. With Eevee it’s very easy to spot you’ve caught a shiny variant – they have a distinctive white/grey sort of coloring that is very different to the brown coat of the regular form. Shiny Jolteon takes on a lime-green look compared to its regular yellow. How many Eevee & Shiny Eevee should you catch to get all Eeveelutions? Well, this one is an interesting question in itself – Eevee of course can evolve into many different types of Pokemon. There’s seven total in the Pokemon Series, and you can currently evolve into five of them in Pokemon Go. If you haven’t yet done the Eevee Evolution name trick, you’ll only need five regular Eevee in order to get one each of the full evolutions. You might want to save two further Eevee and enough candy for when the final two evolutions are added to the game. If you’ve already done the name trick a few times (you can only do it once per evolution), on average 10-13 Eevee should be enough to get you what you want with random chance – though given that it’s a dice roll, prepare to potentially evolve more than that and trade away the duplicates. Catching that many Shiny Eevee is going to be a challenge even with the boosted encounter rate of the event, however – so it might be wise to simply choose which shiny you go for carefully instead – perhaps considering the colors of them, as revealed above. The post Pokemon Go Eevee Community Day: get Shiny Eevee, Last Resort and Stardust Bonuses on the August Community Day appeared first on VG247.